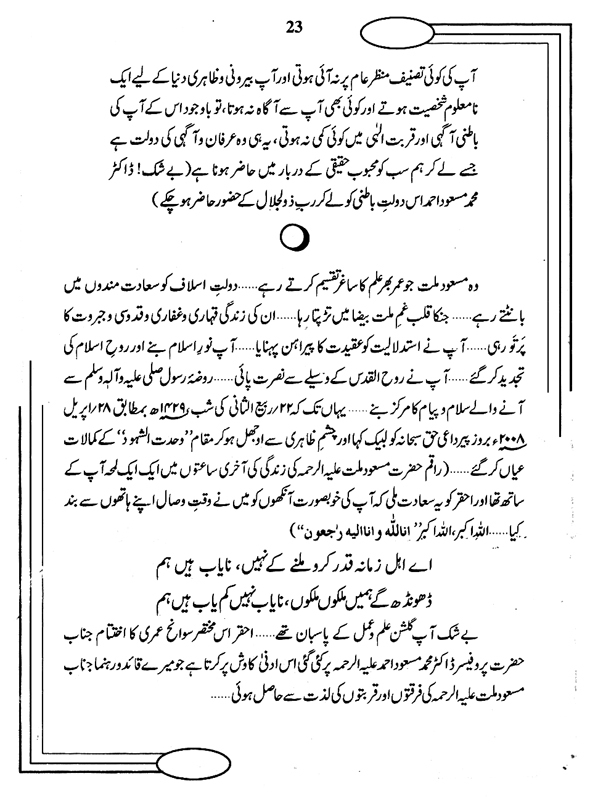 When the pure light of Islamic literacy and knowledge shadowed by the darkness of so called self-constructed and personal oriented Islam----when the heart and soul of the Muslim Ummah became confused----He one of the most qualified, learned and spiritually strengthened personalities----acted like a guiding star and became the beacon for those who had the thirst to seek the classical knowledge of Islam and for those who wanted to follow the Sirat-i-Mustaqim (the straight path). He was highly respected for his excellent approach and efforts to remove the mask of misconception surrounding the true interpretation of Islam. He was the son of Mufti Shah Muhammad Mazhar Ullah Rahmatullah ‘Alayh, the great Mufti, Khatib and Saint (d.1966 c. e) of Delhi (India). The Government of Pakistan bestowed upon him the "IZAZ-I-FAZILAT" award in 1992. He has also received awards from Imam Ahmed Raza Research Institute, Karachi in 1991 and from Pakistan Intellectual Forum in 1992. Prof. Dr. Muhammad Mas‘ud Ahmed worked as Lecturer, Professor, and Principal, paper setter, examiner and member of board of studies at Sindh University, Jamshoro; Khairpur University, Khairpur; Punjab University, Lahore etc. He also worked as a paper setter for the Public Service Commission (Sindh); and was also the Guide and Director of Ph.D. students at the University of Karachi and the Khairpur University, Khairpur (Sindh). He retired as Principal Govt. Degree College and Post-Graduate Studies Centre, Sukkur, Sindh (in Grade 20.) in 1992. Performance of Prof. Dr. Muhammad Mas‘ud Ahmed (as his ACRS shows) remained excellent throughout his service career. These thought provoking books on Imam Ahmed Raza by Prof. Dr. Muhammad Mas‘ud Ahmed brought the personality of Imam Ahmed Raza into the lime light on a global level. 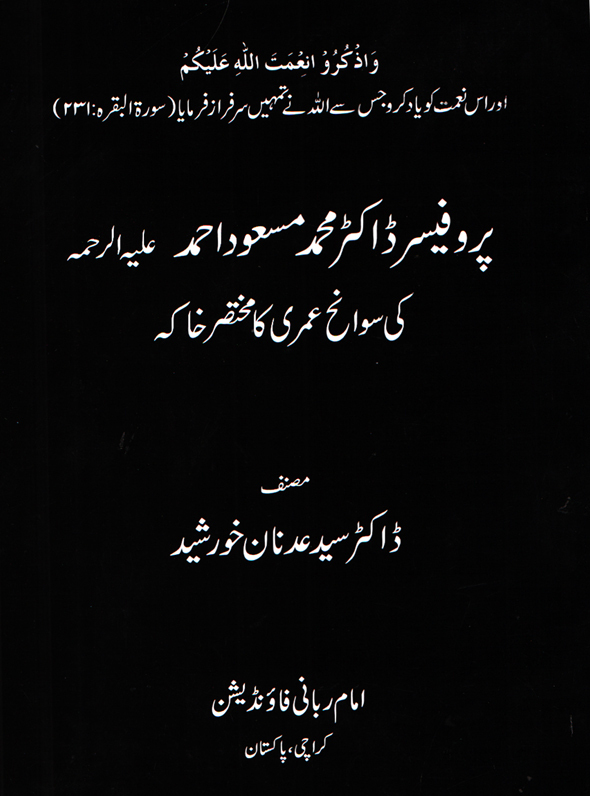 A doctoral dissertation can be composed on his research work on Imam Ahmed Raza Muhadis-i-Bareilwi. 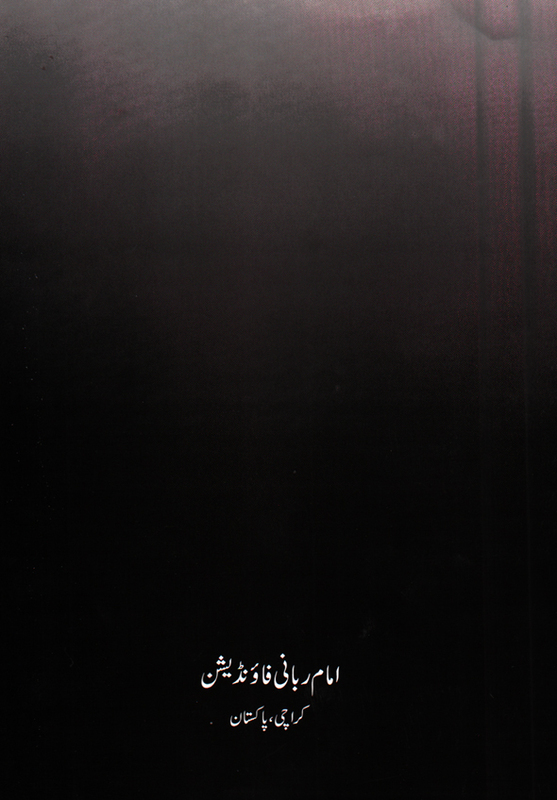 Prof. Dr. Muhammad Mas‘ud Ahmed is known as a specialist in Rizviyyat throughout the Sunni world. He has advised and guided numerous scholars with their research work on Imam Ahmed Raza, such as Dr. Usha Sanyal [Columbia University (U.S.A.)], Dr. Barbra Metcalf [California University (U.S.A.)], Prof. Ghayas-uddin [Birmingham University (U.K.)], Prof. Dr. Majidullah Qadri [Karachi University, Karachi (Pakistan)], Dr. J.M.S. Baljon [Lieden University (Holland)], Dr. Hazim Muhammad Ahmed ‘Abd al-Rahim [Azhar University, Cairo (Egypt)], Dr. Mumtaz Ahmed Sadidi [Azhar University, Cairo (Egypt)], Dr. Ghulam Jabir Misbahi [Bihar University, Muzaffarpur (India)], Dr. Ghulam Yahya Misbahi [Hindu University, Varanasi (India)], Dr. Hafiz Abdul Bari Siddiqi [Sindh University, Jamshoro (Pakistan)], Dr. Manzoor Ahmed Saeedi [Karachi University, Karachi (Pakistan)]. 2. 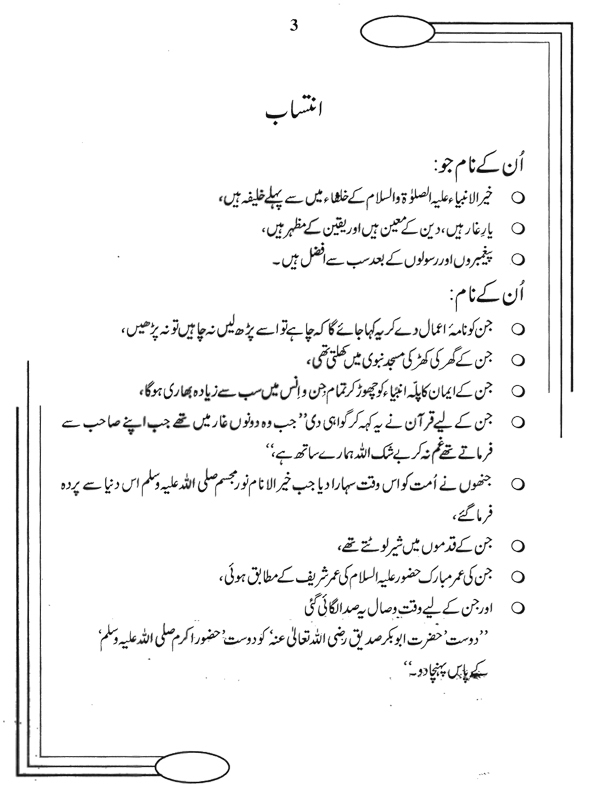 Hazrat AllamaMoulana Dr. Muhammad Saeed Ahmad. 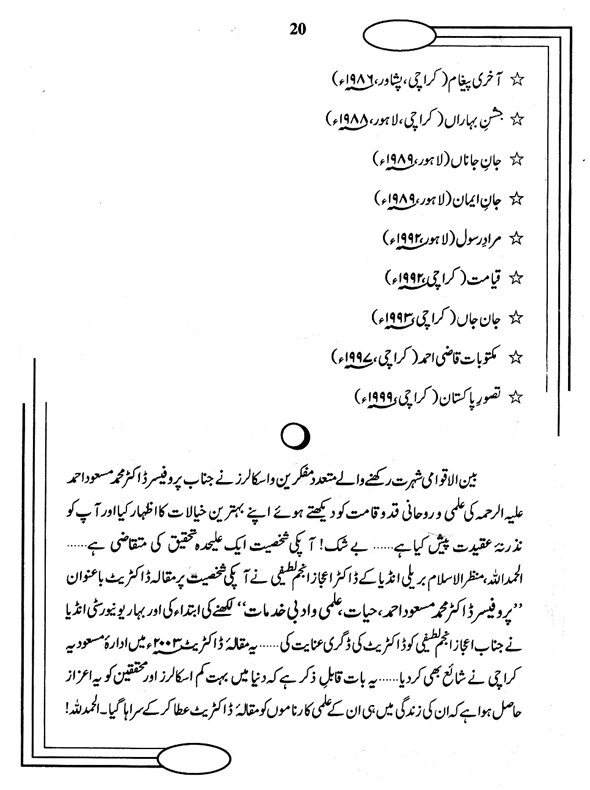 3.Peer-e-Tariqat Hazrat Allama Moulana Hakeem Jaseemuddin Shah Qauadri. 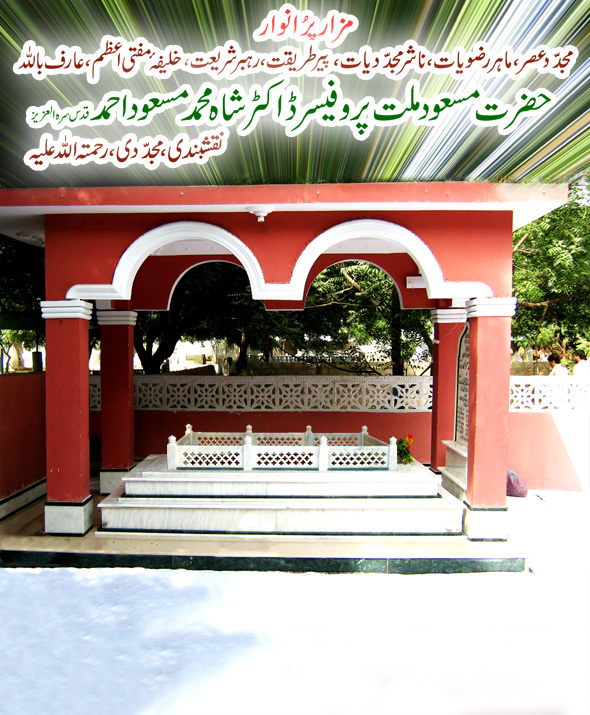 4.Hazrat Allama Moulana Mufti Muhammad Shareef Saeedi (Mohtamim Darul Alam Jamia Khayaban-e-Mustafa, Mirpurkhas, Sindh). 6. 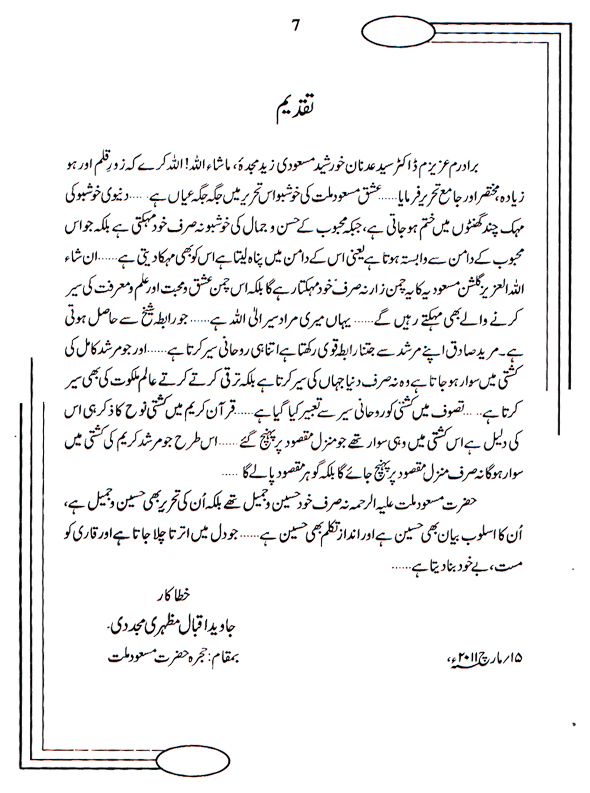 Hazrat Allama Moulana Abu Al Hassan Muhammad Sultan Ahmad Mas'ud Chishti (Hafizabad, District Gujranwala, Punjab). 7. Hazrat Allama Moulana Hakeem Akbar Dars (son of Hazrat Alama Moulana Zahoor ul Hassan Dars, Karachi). 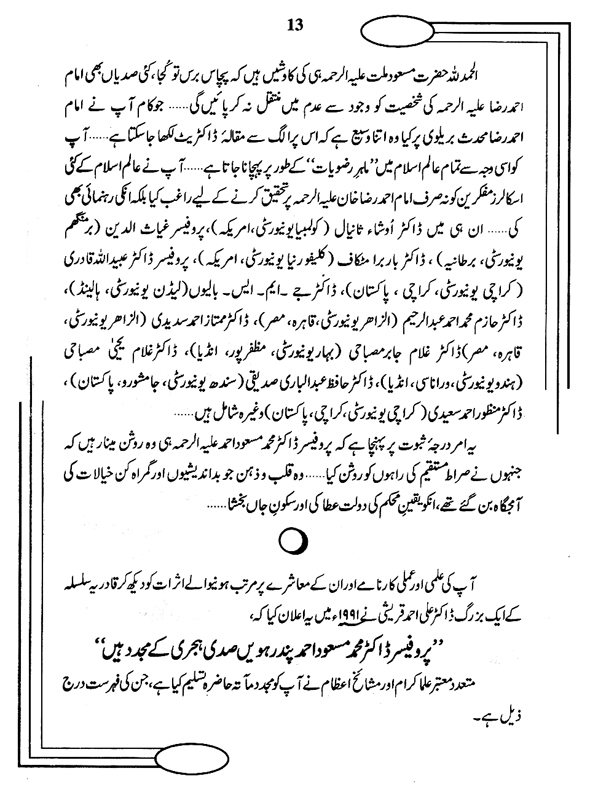 7.Peer-e-Tariqat Niaz Ahmad Naqshbandi,Ashrafi Mujaddidi Karachi. 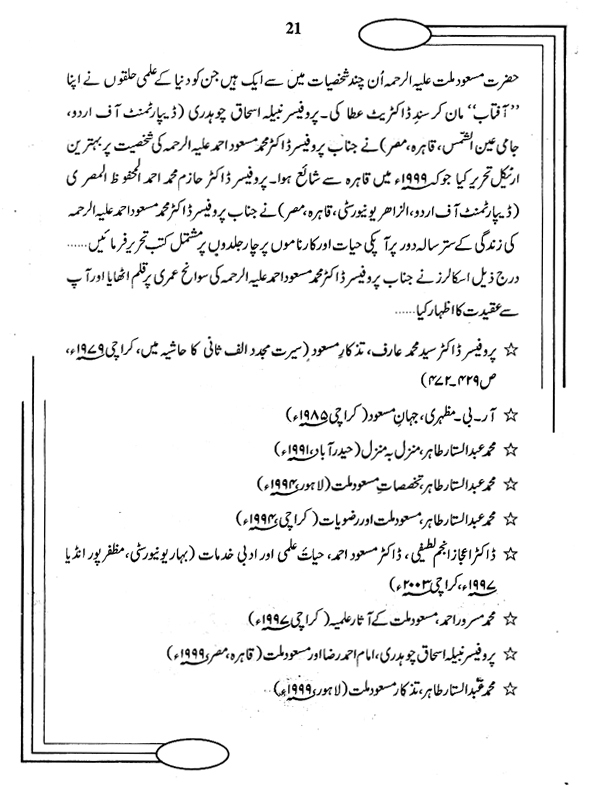 8.Hazrat Allama Moulana Abul Hamid Mohammad Rafique Durrani GulMohammadio Karachi. 10. Moulana Mohammad Munir Naqshbandi (son of Qari Abdul WaheedRabani Naqshbandi Bahawalpur,Punjab). 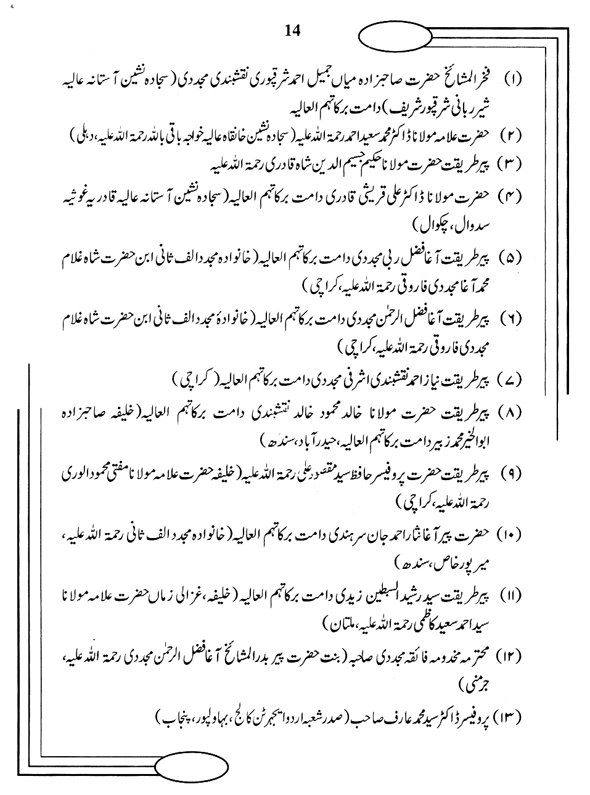 10.Hazrat Peer Agha Nisar Ahmad Jan Sirhandi (Khanwada Mujadid Alf Thani, Mirpurkhan, Sindh). 11.Moulana Qari Noor Muhammad Owasi Quadri (Bahawalpur,Punjab). 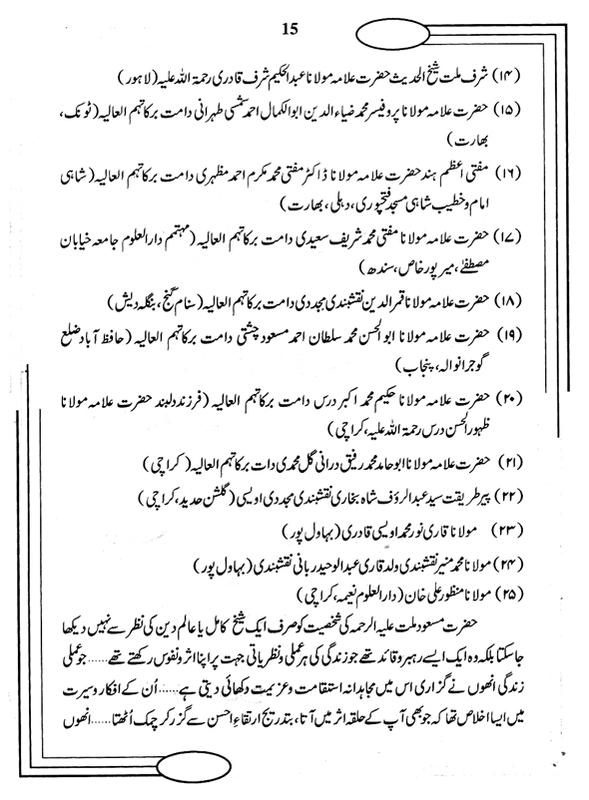 11.Peer-e-Tariqat Syed Rasheed ul Sabtain Zaidi (Khalifa Hazrat Allama Moulana Syed Ahmad Saeed Kazmi, Multan). 12. 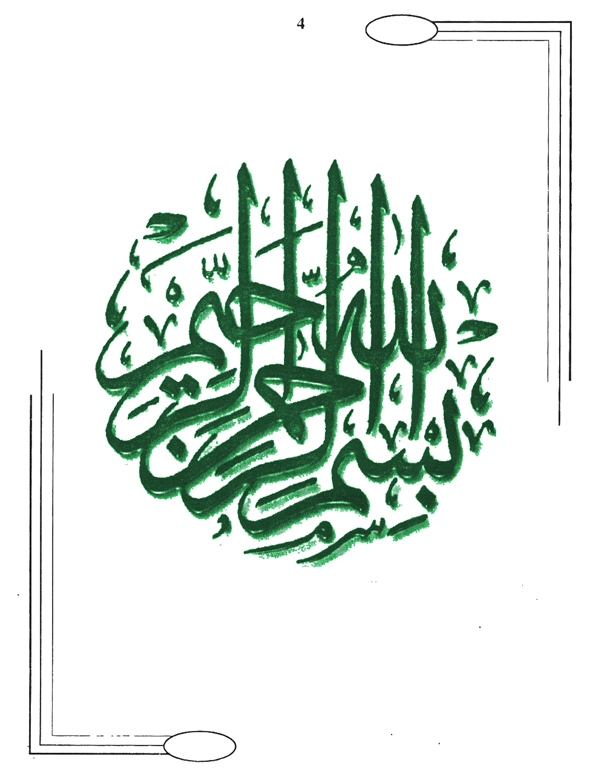 Mohtarma Makhdoma Faiqah Mujaddidi Sahiba (Bint-e-Hazrat Peer Badar ul MashaikhAgha Fazzal ul Rehman Mujaddidi, Germany). 15.Peer-e-Tariqat Syed Abdul Rauf Shah Bukhari, Naqshbandi Mujaddidi (Gulshan-e-Hadeed, Karachi). The Soul of Islam (New York, 2004) etc. The literary works of Prof. Dr. Muhammad Mas‘ud Ahmed are being translated into various languages such as Arabic, Persian, French, Dutch, English, Pushto, Sindhi, Hindi, Gujrati, and Bengali. These translated books are then distributed throughout the world. These can also be viewed on www.almazhar.com . 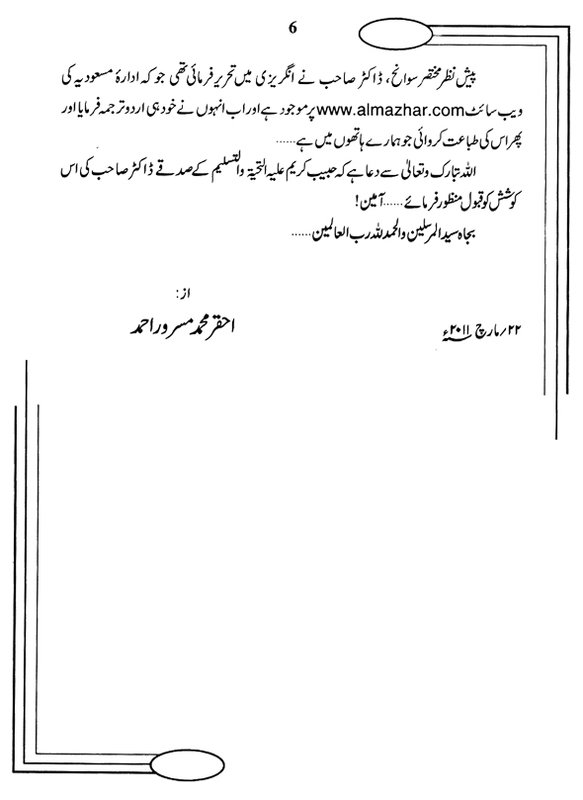 Professor Dr.Muhammad Mas'ud Ahmad had Ijaza & Khilafat (permission for initiation of disciples into particular Sufi Orders) in different Sufi Orders. 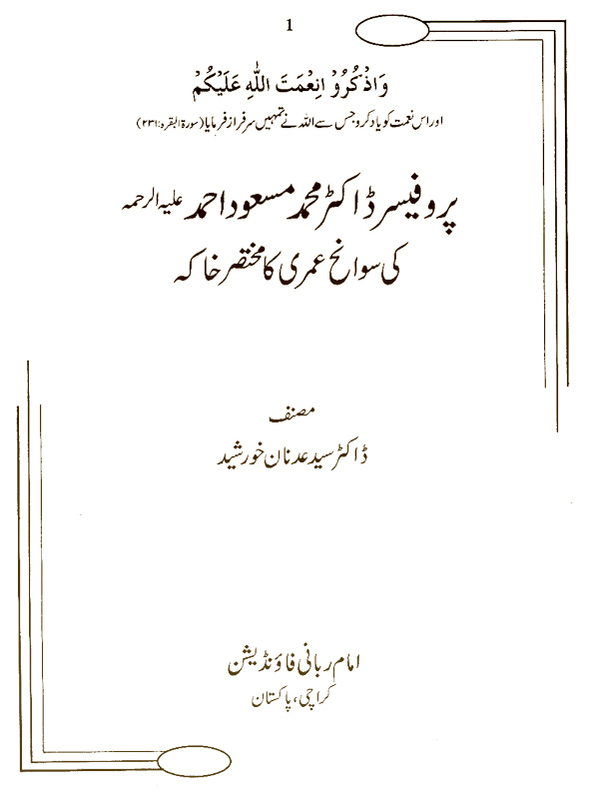 Spritually his personalitywas enlightened and bestowed by two great saints of Naqshbandiyya order; first of all from his father Mufti-e-Azam Hind Mufti Shah Muhammad Mazharullah Rehmatullah Alayh (Dehli India) and afterwards from his brother-in-law Mufti Muhammad Mehmood Alwari Rahmatullah ‘Alayh (Hyderabad Sindh Pakistan). 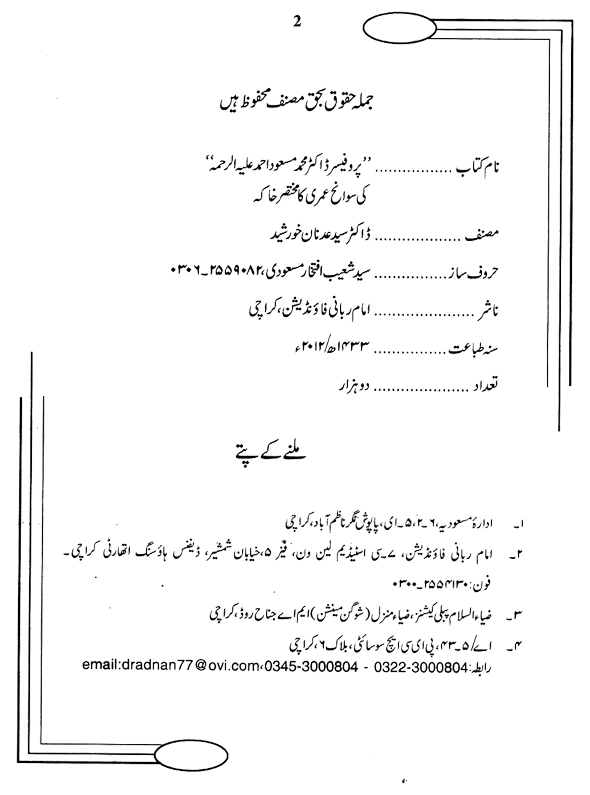 Moreover Hazrat Bader ul Mashikh Fazal ul Rehman Mujaddidi (Lahore, Punjab Pakistan). also give his Ijaza in Naqshbandid order. In Quadriya order he had Ijaza and Khilafat from Sheikh Sheikh Syed Zain ul Abideen Quadri (Noorai Shareef,Sindh Pakistan). In Chistiyah order he had Ijaza and Khilafat from Hazrat Hakeem Syed Ikram Hussin Saykri Alayh al Rehma (Hyderabad, Sindh, Pakistan). 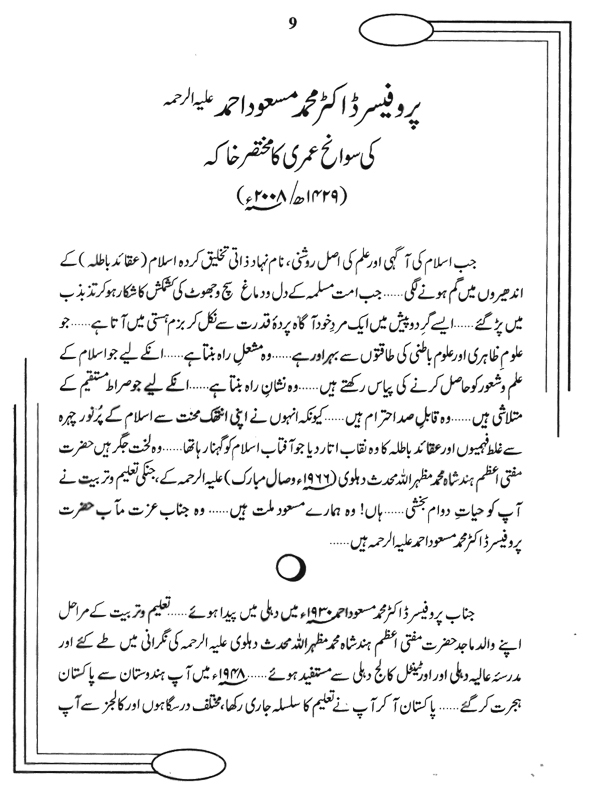 In Owaisiyah Quadriyah order, he had Ijaza and Khilafat from Allama Muhammad Faiz Ahmad Owaisi (Bhawalpure, Punjab,Pakistan). which he saw very rarly now-a-days. 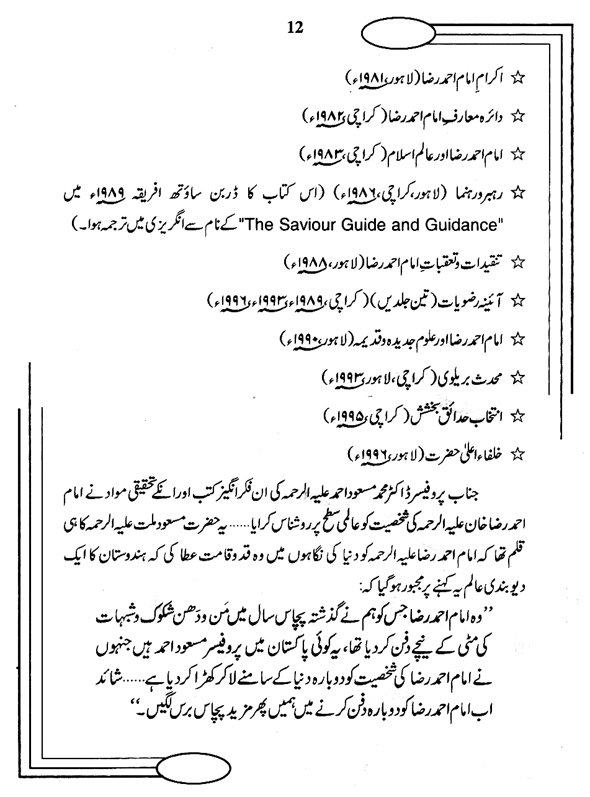 Hazrat Prof. Dr. Muhammad Mas'ud Ahmed wasan absolute level of Saint (Wali-e-Kamil), above mentioned Ijaza& Khilafat and his whole life is the prove of it. 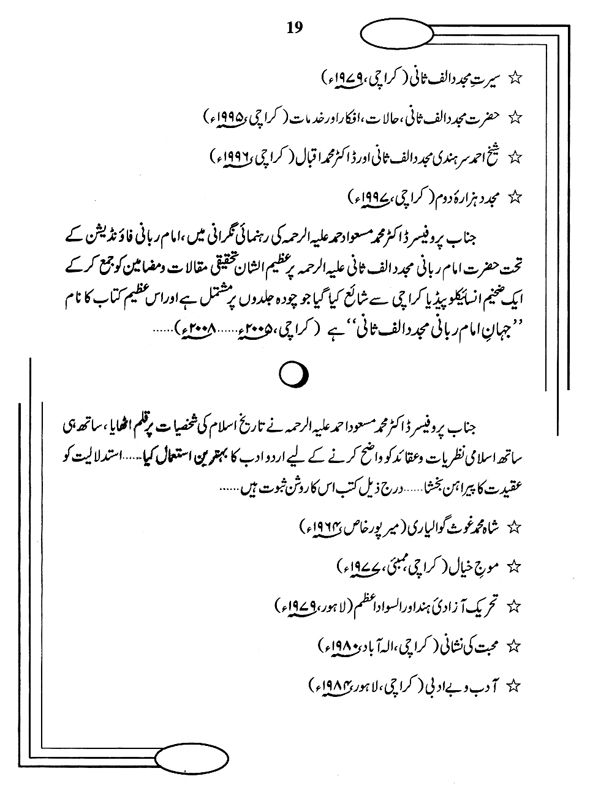 His father Mufti Shah Muhammad Mazharullah Rehmatullah Alayh (Dehli, India) also given Ijaza (permission) of Wazaif and analiyat of Mazhariya Mas'udiyah order from (Hassan Hyssain). 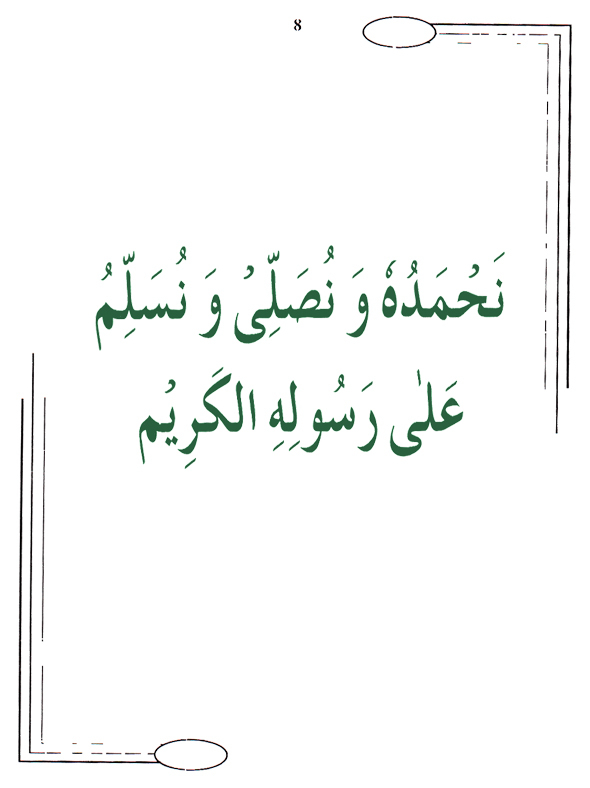 A huge collection of research papers/articles on Imam Rabbani Mujaddid Alf-i-Thani was compiled under the supervision of Prof. Dr. Muhammad Mas‘ud Ahmed under the auspices of Imam-i-Rabbani Foundation, Karachi with the title of “Jahan-i-Imam-i-Rabbani Mujaddid Alf-i-Thani” in eleven volumes which have been published. 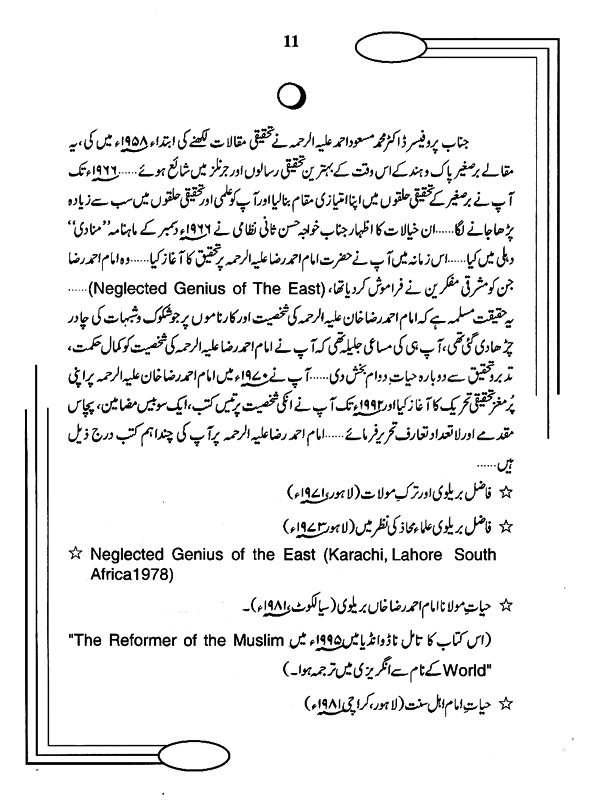 Hazrat Prof. Dr. Muhammad Mas'ud |Ahmadbecome the light of Islam and revive the spirit of Islam in fifteenth centuary. He keep on working for the benefit of Muslim Ummah in his whole life. He revives salamdirectly from Roza-i-Rasool and finally at 22 Rabi ul Sani 1429 hijri accordingly 28th April 2008 on Monday,he left us in tracking the path of 'Dar-ul-Baqa'. His shrine in Karachi is the centre of souyrceof spritual inspiration. May Allah rest his soul in peace (Ameen).